Lipids are fats circulating in the blood in various forms i.e. Total Cholesterol, Triglycerides, LDL Cholesterol, VLDL Cholestrol, HDL Cholesterol etc. Dyslipidemia (abnormal lipids) is one of the major risk factors for cardiovascular disease in diabetes mellitus. The characteristic features of diabetic dyslipidemia are a high plasma triglycerides, low HDL cholesterol and increased small dense LDL-cholesterol particles. The availability of multiple lipid-lowering drugs provides new opportunities for patients to achieve target lipid levels. Lowering of cholesterol with Statins reduces diabetic patients' relative cardiovascular risk. Although drug therapy for dyslipidemia must be individualized, most people with diabetes mellitus are candidates for statin therapy. Some patients need treatment with multiple agents (Fenofibrate or Nicotinic Acid in addition to statins) to achieve therapeutic goals. "Controlling Lipids is as important as Controlling Blood Glucose levels"
The cardiovascular complications of diabetes like heart attack, angina and stroke happen due to high levels of lipids in the blood, even with normal blood glucose levels. Many studies have shown that controlling lipids adequately prevent or delay these cardiovascular complications. HDL Cholesterol (also called as "Good" Cholesterol) gives protection against the formation of atherosclerotic plaques which are the root cause of blockage in arteries supplying blood to heart muscles. 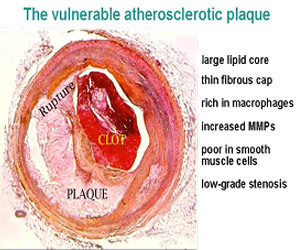 LDL & VLDL Cholesterol are harmful lipids as they cause the formation of atherosclerotic plaques in the coronary arteries and other important blood vessels. Triglycerides are complexes of fat formed by liver when fatty food is absorbed from intestines. 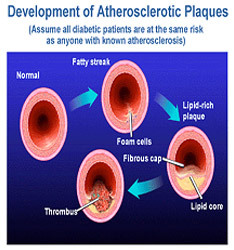 Typically, in uncontrolled diabetes levels of triglycerides are raised, they also contribute to atherosclerosis. High levels of triglycerides can even cause pancreatitis. Diabetes is associated with a high risk of cardiovascular disease. The management of dyslipidemia, a well-recognized and modifiable risk factor among patients with type 2 diabetes, is an important element in the multi-factorial approach to prevent coronary heart disease. Diabetic dyslipidemia typically consists of elevated triglyceride, low high-density lipoprotein cholesterol (HDL-C), and the predominance of small dense low-density lipoprotein (LDL) particles. LDL cholesterol (LDL-C) levels in patients with diabetes are similar to those found in the rest of the population. During the past few years, clinical trials have provided evidence that lipid-lowering therapy has a similar beneficial effect on cardiovascular outcomes in diabetic and nondiabetic individuals. According to current guidelines, the primary lipid target is an LDL-C <100 mg/dL (<70 mg/dL in very high-risk patients) and statins are the agents of choice. The appropriate management of dyslipidemia in patients with diabetes, particularly in individuals with low LDL-C, remains controversial. To achieve lipid targets, attention should be directed first toward non-pharmacologic therapeutic interventions (i.e. Lifestyle Modifications, such as healthy diet, exercise and weight loss) to control dyslipidemia. Statin therapy is recommended for most subjects but, frequently, a combination of lipid-lowering agents is required. Lipid profile should be done every year (if normal), and every 3-6 months if abnormal.